I know I already have a recipe for peanut butter cookies on my blog, but I found this one on Pinterest and it looked interesting. I love Pinterest, don’t you? I could waste so many hours looking at recipes. These peanut butter cookies are soft and delicious thanks to a secret ingredient. The original recipe came from texanerin.com, and I saw it on thenutritiontwins.com website. 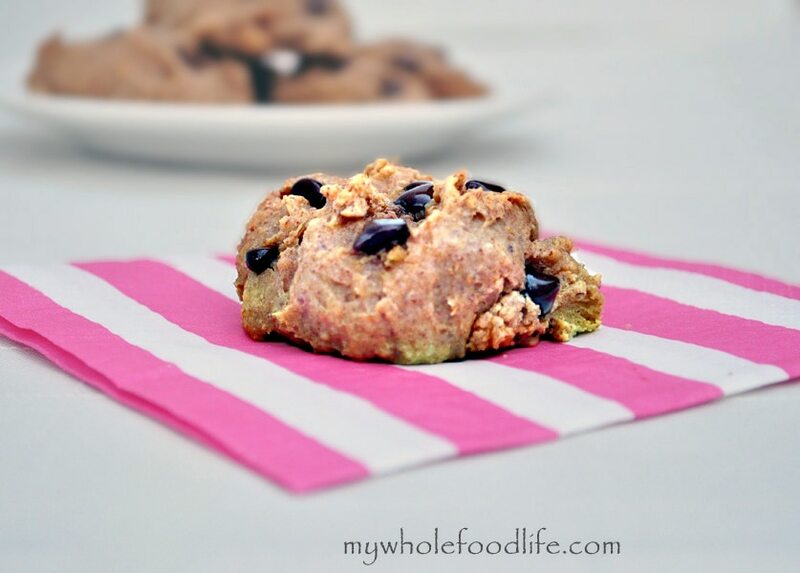 These cookies look naughty, but they are not as unhealthy as you would think. I thought this recipe was so good, I wanted to share it with you all. These are grain free and they are really easy to make. My husband had like 5 of them when they first came out of the oven. I had to stop him so I had some to photograph! If you are a visual person, check out the quick video below. It shows how easy these are to make. Combine all the ingredients, except for the chocolate chips, in a food processor and pulse until very smooth. Roll the dough into balls. The mixture will be very thick and sticky. I got about 15 cookies. Please do not let the beans in this recipe turn you away. I promise you cannot even taste them in here. These are good! Melissa, these are soooooooooo good! Thank you! Wow, these are AWESOME!!! I was skeptical; the dough didn't smell particularly enticing, but it smelled so good baking and the taste is really, really good. Thanks!!! I'm looking for a better option for the peanut butter cookies with a Hershey Kiss on top. Do you think this recipe would work well for that? I think it might. They may be slightly softer in texture though. Melissa's 3 ingredient peanut butter cookie is an absolutely awesome recipe to use for the pb cookies with a kiss on top. I will never make peanut butter cookies a different way. It's my go-to!! Thanks for letting me know Valeria! I have been having some issues with the comments and I haven't figured out the problem yet. I am sorry for the inconvenience. I hope it gets resolved soon. Thanks Melissa, glad it wasn't only me. I hadn't received your last comment, so I thought I'd check on the website as you are brilliant about replying!! I hope it gets resolved soon, I love hearing back from you. And about the recipe, I just wanted to say that my batter was a bit dry as well, but I added a splash of oat milk, and it was perfect. Is there a way of making these cookies more chocolate? I just loved them so much, and I am addicted to chocolate, so I was just wondering if you had any ideas. What if I added cocoa powder? The problem should be fixed now Valeria. :) If you wanted to add chocolate to these, you could probably add some cocoa powder and even blend up some chocolate chips in the batter. Valeria, We are all chocolate lovers in my house too! So I tried using chocolate hazelnut butter instead of peanut butter, put batter in fridge for 30 mins so the batter would be easier to work with, and the cookies came out so amazing! OMG that sounds so good! I will be trying that sometime. Yes you might have to add a little more honey. Let me know how they turn out. I am not sure why you are not getting the comments. :( I can have my husband look into that. Thanks for letting me know how the cookies turned out. You can buy chocolate hzelnut butter by Justins at most health food stores. Thanks for letting me know. I will look for it. I found chocolate peanut butter so far! Thanks for looking into the comments for me. The "original" batch is in the oven now :-) Thanks for all your fabulous recipes. I just love them and can't believe how easy they are to make!!!! OMG!!!!! These are amazing. I didn't change a thing with the first batch. The second batch I used chocolate hazelnut butter instead of peanut butter and it was delish as well! I just had to chill the batter for about 30 mins because the hazelnut butter made the batter a bit to thin to work with. The time in fridge did the trick and the batter was easy to work with. I let them cool completely and stored in a container with rice on bottom in the fridge as recommended. We ate on them for 3 days and they were as good the on the last day as they were on first day! Definitely will be making these every week!!! Thanks Melissa! Another homerun!! Thanks Suzy! That sounds amazing!! I may try that next time. When you refer to the peanut butter what Is + 2 T ?